A family farm in Creston, NC that is also a microbakery. Also notable is their backyard beehive endeavor! 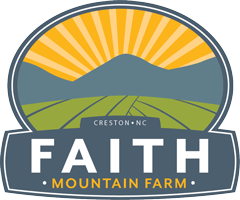 Faith Mountain is a family farm located in Creston, NC. Try some organic produce, sunflowers, delicious baked goods, and raw honey from Faith Mountain Farm! Delivery to Boone, NC and surrounding areas is available.